Clear your calendar! 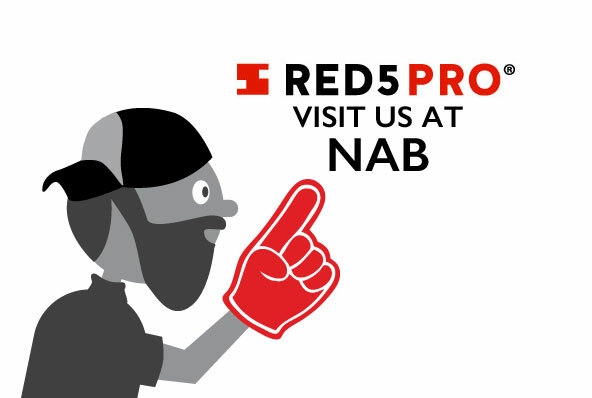 Red5 Pro is coming to NAB, 2019. We are very excited to show off some new partnerships and special features we have been developing. Join us in Las Vegas April 8th - 11th. If you can't make it, no worries! We're sure that a few live streams will be going out that week. Each day, our Co-Founder Chris and Director of Technical Sales Dima, will be doing two hours of scheduled demos showing our new 360 degree player for iOS. CD Networks will be showing Red5 Pro running on their Edge Compute Platform showcasing high performance and real-time latency. Singular.Live will be showing a demo that incorporates their graphics engine into real-time live streams by Red5 Pro. By combining the two technologies, it will enable the displaying of graphic over the stream itself. That graphic can be updated in real-time. Think of it like the headline ticker at the bottom of a newscast, or a list of updated sports scores during a game. As we've mentioned before Limelight, has been using Red5 pro in their own product for some time now, so we are excited that they will be demoing its use again this year. We were already a hit at last year's IBC Conference, so we are sure that we'll make an impact at NAB as well. Heading to NAB? Schedule a time to talk to us about Red5 Pro, the fastest streaming platform on the market!